Nestled in the beautiful Blue Ridge Mountains of North Carolina, our Rental Cabins Western NC are perfect Vacation Rentals in Western NC for anyone who wants to enjoy all of the great Western North Carolina Attractions, including Linville Caverns NC, Linville Falls, NC, Linville Gorge North Carolina, Biltmore Estate Asheville, and the many other interesting and unique Things to Do in Western North Carolina. Located on the Linville River, our Rental Cabins Western North Carolina are perfect getaways for fishermen of all kinds, and we are located at the center of all of the best Fly Fishing North Carolina hotspots. With so many commercialized and impersonal Hotels Linville NC and Linville NC Motels, wouldn’t it be nice to stay in cozy Linville Falls Lodging like our Rental Cabins Western NC during your next Fly Fishing in NC vacation? When you stay here at Linville River Log Cabins, the Linville River is at your doorstep. You are also just a short drive away from some addtional fly fishing destinations like the Watauga River, the New River, and countless other lakes, rivers, creeks, and ponds. The Watauga River offers perfect conditions for North Carolina Fly Fishing and is close to our Western NC Cabin Rentals. With its beginnings on the slopes of Grandfather Mountain North Carolina, the Watauga River flows along Highway 105 in Boone and Foscoe and all the way into Tennessee. It adds to the scenic beauty of the Grandfather Mountain North Carolina area in which our Rental Cabins Western NC are located. In addition to small stream North Carolina Fly Fishing, the Watauga River also boasts some of the Linville NC area’s best tailwaters, a term used to refer to the calmer waters just downstream from a dam, culvert, or bridge. Starting in Elizabethton, Tennessee, the Watauga River’s tailwaters flow for sixteen miles, and offer incredible Fly Fishing in NC opportunities. Our Linville North Carolina Cabin Rentals Lake River Creek Pond make ideal Linville Falls Lodging for fishermen and their families who want to enjoy the premier Fly Fishing North Carolina conditions provided by the Watauga River. Our Western NC Cabins Rentals are close to another of the Linville Gorge North Carolina’s most plentiful rivers, the New River. Thought to be one of the oldest rivers in the world, this fantastic Fly Fishing in NC river is an ideal place to catch smallmouth bass, muskie, and trout. Just minutes away from our Vacation Rentals in Western NC, the New River is often home to guided North Carolina Fly Fishing tours, and is the perfect place to spend you’re your Fly Fishing in NC vacation—when you’re not enjoying the comfort of our Western NC Cabins, that is. 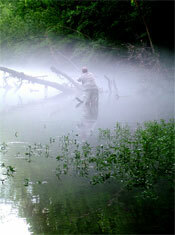 Our Western NC Mountain Cabins Rentals’ namesake, the Linville River, is another popular Fly Fishing in NC destination. Originating high atop the slopes of Grandfather Mountain North Carolina, this river has been credited with the formation of breathtaking geological structures like Linville Gorge NC and Linville Falls. Come July, the waters of the Linville River, which are supported by hatcheries, are replete with trout, making for excellent Fly Fishing North Carolina. Conveniently close to our Rental Cabins Hot Tub Western North Carolina, the Linville River not only provides our Western NC Mountain Cabins Rentals with a beautiful backdrop, but allows for some great North Carolina Fly Fishing, as well. The Grandfather Mountain North Carolina area in which our Western North Carolina Cabin Rentals are located is full of great spots for Fly Fishing in NC. In addition to the Watauga River, the New River, and the Linville River, those with a penchant for Fly Fishing in NC will want to bring their poles to the hatchery-supported North Toe River, Wilson Creek, Lost Cove Creek, Harpers Creek, or even Grandfather Trout Farm in Grandfather Mountain North Carolina. Our Linville Falls Lodging is ideal for a North Carolina Fly Fishing vacation, and is close to fantastic Western North Carolina Attractions like Linville Gorge NC, Biltmore Estate Asheville, numerous Hiking Trails Grandfather Mountain NC, and many other Linville NC Attractions. When you visit our Blue Ridge Parkway Cabins for a North Carolina Fly Fishing vacation, you’ll be surprised to find that the area around our Western NC Mountain Cabins Rentals is home to innumerable Western North Carolina Attractions that are just waiting to be explored.